As Vermont legislators prepare to meet their crossover deadline, Gov. Peter Shumlin is preparing for a fundraising trip to Puerto Rico. According to the Democratic Governors Association's website, Shumlin is confirmed for a two-day conference this weekend in Fajardo, a picturesque resort town on the eastern end of the island. Shumlin's Puerto Rican excursion comes a mere nine days after he returned from a weeklong Town Meeting Day vacation in Dominica, the Caribbean island nation on which he owns property. It also comes a day after crossover, the deadline by which most legislation — with the exception of major money bills — must pass one legislative body or the other. "As of now he is scheduled to go," Shumlin spokesman Scott Coriell says. "But should the legislature remain in session over the weekend he will cancel those plans." Shumlin was heavily criticized by Republican opponent Scott Milne during last fall's gubernatorial race for spending 141.5 days of his second term out of state. Much of that time, as Seven Days reported last September, was spent raising money for the DGA, which he chaired at the time, and his own reelection campaign. Until recently, the governor had cut back on his out-of-state travel. 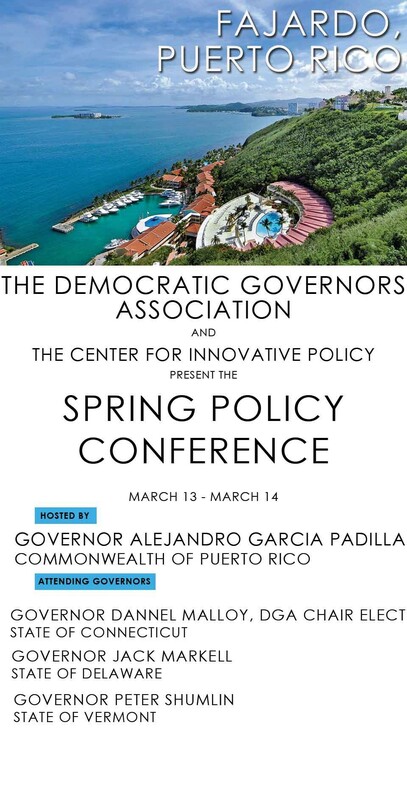 This weekend's conference, hosted by Puerto Rico Gov. Alejandro Garcia Padilla — Connecticut Gov. Dannel Malloy and Delaware Gov. Jack Markell are also scheduled to attend — is billed as the organization's Spring Policy Conference. Such policy conferences typically feature the DGA's big-dollar corporate and labor donors, who spend the weekend schmoozing with elected officials and their staff members.